best practice for pest and disease management. The agro-ecological context of this site is a rain-fed cropping system within the Wimmera, which is a semi-arid (average 414 mm of annual rainfall) Mediterranean type environment. Soil is an alkaline grey self mulching clay Grey Vertosol. To take a better look at the SCRIME research site, use your keyboard and mouse to navigate the experimental area. To zoom in or out, left mouse click inside the panorama and use the mouse's 'scroll wheel' (if you have one) or press and hold 'Shift' or 'Ctrl'. To explore the landscape, click and hold the left mouse button on the landscape and move the mouse left, right, up or down or use 'cursor keys'. If you experience any problems with the interactive panorama click outside the landscape and press 'Ctrl' and 'F5'. Each interactive landscapes is 2 MB, this might take some time to automatically download if you're using a slow internet connection. If you experience any problems you should update the 'Adobe Flash Player'. This software can be downloaded for free from the Adobe website (external link). Click on icons appearing in the landscape for access to photographs, further information and other panoramas in this experimental area. To date, SCRIME has been used primarily as a resource for postgraduate students within collaborative projects, where it provides a known history of management and rotation treatment. With regard to the original objectives, these have not yet been thoroughly addressed. Now that 12 years have lapsed and the rotations have completed their cycles collectively, it is expected that the original three objectives can be fully addressed. Scientific publications arising from this trial are listed below. Figure 1. Field lay out and site design of SCRIME, Longerenong, Victoria. Example is for crops sown in 2010. For the field layout, values in square boxes are plot number and prefix values to crops are the rotation number. The SCRIME site was established in 1998, so at the end 2009 each three year rotation will have completed four cycles and each six year rotation will have been through two cycles. 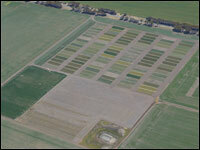 A total of 108 plots are sown each year with three replicates of each phase of each rotation (see figure below). Each plot is 14 metres by 30 metres in size. In 2004, rotation number two was modified to that listed above. The original design was continuous wheat (high fertiliser - double urea). In 2010, the pulse-cereal-pulse rotation (number five in list above) was abandoned and changed to incorporate native grasses. The decision was made due to an uncontrollable weed (ryegrass) infestation in this treatment. Over the past decade regular sampling and analyses of various soil and plant properties has occurred annually. This includes grain yield and quality, emergence counts, biomass at anthesis and maturity, soil moisture at sowing, anthesis and maturity (neutron probe), soil chemistry including surface soil organic matter content, total carbon and nitrogen, and sowing mineral-nitrogen. Soil pathology was collected in 1998, 1999, and 2001 and plant pathology was collected in 1999, 2000, 2001, and 2002. Vu DT, Tang C, Armstrong RD (2008) Tillage system affects phosphorus form and distribution in three contrasting Victorian soils. Australian Journal of Soil Research 47, 33-45. Vu DT, Tang C, Armstrong RD (2010). Transformation and the availability of soil P fractions in three contrasting soil types of Victoria using fractionation and isotopic dilution techniques. Journal of Soils and Sediments 10 18-29. Holloway G (2009) Root Diseases in Sustainable Cropping Rotations in Mediterranean Environments (Department of Primary Industries technical report, Victoria). Armstrong R, Perris R, Partington D, Hollaway G, Unkovich M (2010) Crop and pasture rotation and tillage practice have minimal impact on grain production during a prolonged period of drought in the Wimmera. Australian Society of Agronomy Conference. New Zealand.